When the United States goes to war, the nation's attention focuses on the president. As commander in chief, a president reaches the zenith of power, while Congress is supposedly shunted to the sidelines once troops have been deployed abroad. Because of Congress's repeated failure to exercise its legislative powers to rein in presidents, many have proclaimed its irrelevance in military matters. After the Rubicon challenges this conventional wisdom by illuminating the diverse ways in which legislators influence the conduct of military affairs. Douglas L. Kriner reveals that even in politically sensitive wartime environments, individual members of Congress frequently propose legislation, hold investigative hearings, and engage in national policy debates in the public sphere. These actions influence the president's strategic decisions as he weighs the political costs of pursuing his preferred military course. 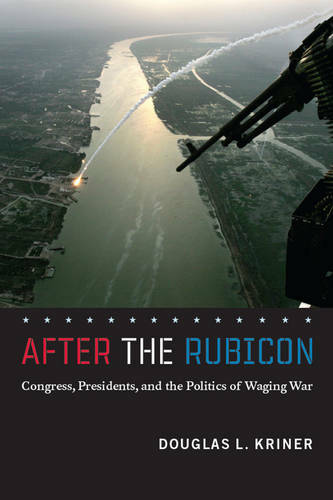 Marshalling a wealth of quantitative and historical evidence, Kriner expertly demonstrates the full extent to which Congress materially shapes the initiation, scope, and duration of major military actions and sheds new light on the timely issue of interbranch relations.